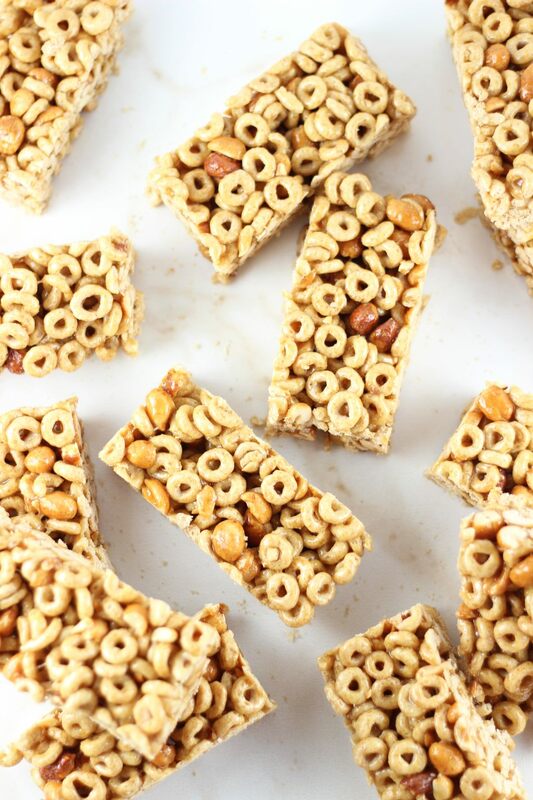 These no-bake Honey Nut Cheerios Cereal Bars are a delicious and wholesome snack or breakfast for on-the-go! 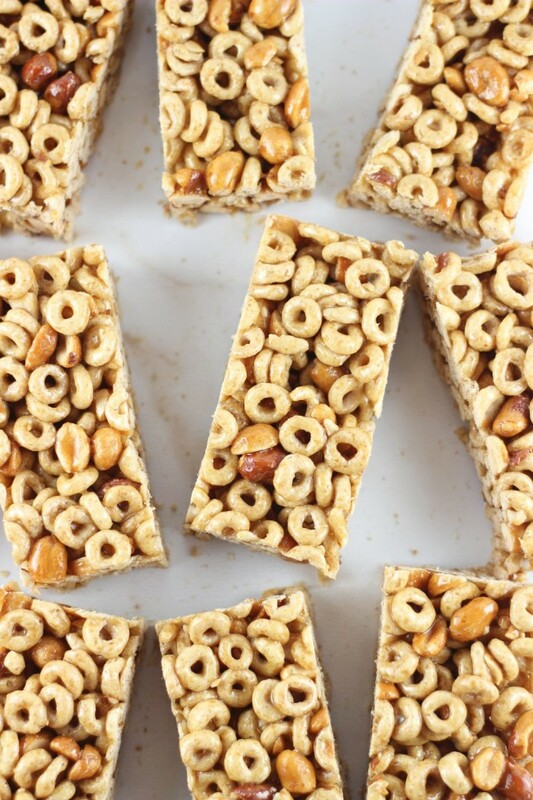 These tasty and sweet bars include Honey Nut Cheerios, honey, brown sugar, and honey-roasted peanuts, for a delightful snack! 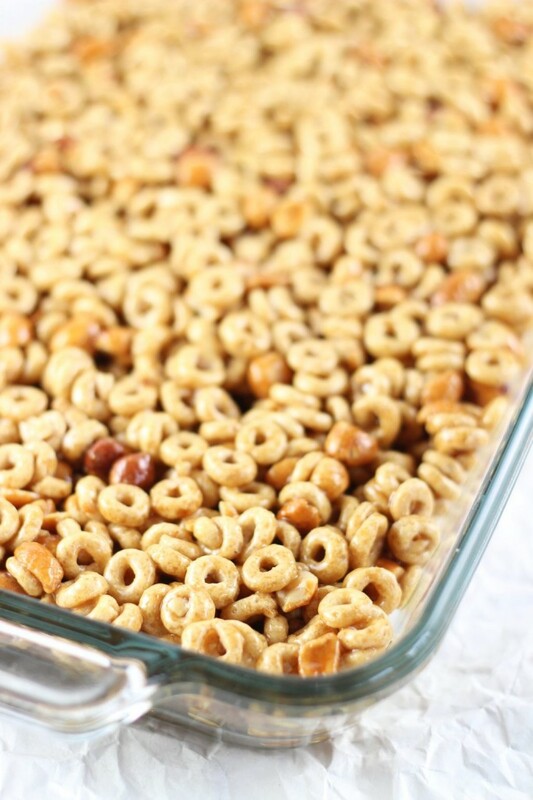 Is there anyone among us that didn’t grow up with Cheerios as a breakfast staple in their household? 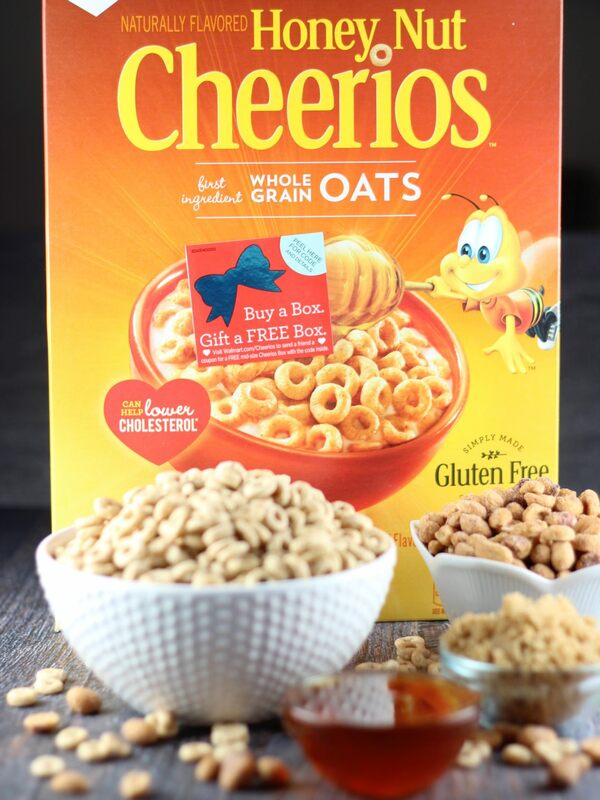 Perhaps not even exclusive to breakfast, because I remember many an occasion where I was snacking on Cheerios right out of the box, or from a plastic baggy. Like, last week. No, seriously. But I also remember my mother packing them in plastic bags for my brother and I to take with us to school for snacks when we were kids. I’ve always been a person who just loves cereal. I will often choose it over a traditional dinner, and I could pretty much eat it for every meal. I don’t, but I could. 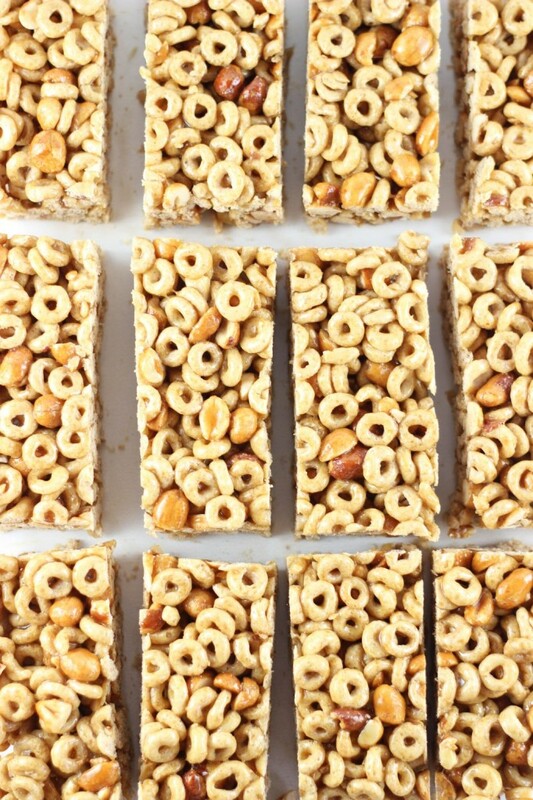 When I was in college, the cafeteria kept the cereal bar open all day long, and sometimes I would just have a couple bowls of Cheerios for dinner. My S.O. is also quite partial to Cheerios, with Honey Nut also being his flavor of choice, and he will periodically bring home several boxes. He loves a bowl as his “midnight snack”…. sometimes that snack is at 3 or 4am, but that’s just a very early breakfast, right?? I asked him if he remembered eating them a lot as a kid, and he said that when his mother would take him to the grocery store, she’d get to the cereal aisle and would let him pick what kind of cereal he wanted, and his favorite now is the same as his favorite was then. Charming, huh? As a person who still packs their lunch (and pretty much every other meal of the day) to take with me on-the-go, I’m especially appreciative of portable meals and snacks. There’s always something in the bottom of my purse or stashed in my gym bag for when I need a quick bite. 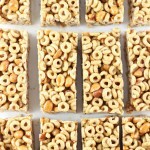 I wanted to make Honey Nut Cheerios Cereal Bars with the box I picked up, and so I set out to make them, incorporating more honey nut flavors with the addition of… uh, honey, of course! I also thought that honey-roasted peanuts would be a delicious addition, and they are certainly in keeping with the flavor theme! These bars are sweet, a little salty, and are basically jam-packed with honey nut flavor. 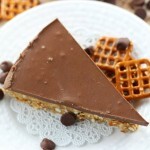 This is also a simple no-bake recipe that has a very short ingredient list, and comes together in minutes! These tasty and sweet bars include Honey Nut Cheerios ™, honey, brown sugar, and honey-roasted peanuts, for a delightful snack! 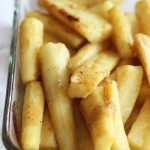 In a large saucepan over medium heat, combine brown sugar, honey, and butter. Stirring frequently, bring the mixture to a boil, and boil for exactly 2 minutes. Remove from heat, and pour the honey mixture over the cereal mixture. Stir to combine, and press into the bottom of a lightly greased 8x11-inch pan. Allow 15-20 minutes for the bars to set. 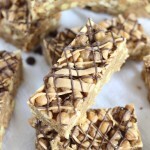 Cut into 12 bars, and enjoy! These can be stored at room temperature in a cool, dry place. We love to have them around too! Such great snacks to have on hand. They are SO easy! It’s wonderful to have super quick and easy recipes on hand, isn’t it? 🙂 Thanks, Kelly! time for a big breakfast. I think it could do with less brown sugar because it is very sweet, and I used plain cheerios because they have less carbs. This sound great! I love cereal as well. This is a great idea when you’re on the go. 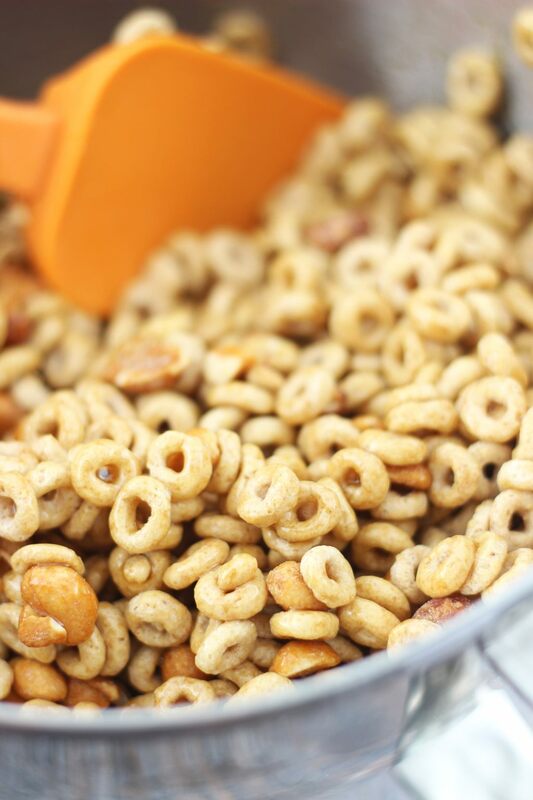 I love Honey Nut Cheerios and so do the kids. Thanks for sharing on Sunday’s Best Linkup. Looking forward to seeing more posts. 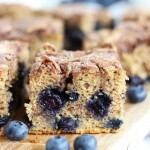 But thanks so much for sharing this recipe! I am going to try making these this weekend and see if I can save myself another trip to the store and a few thousand dollars keeping up with his appetite. I just made these with multi grain Cheerios and salted peanuts…… Then I added 1/4 cup of coconut and once everything was cooling down mixed in a handful of chocolate chips, because they were next to my coconut, couldn’t help myself. I found them a bit to sweet, I would have added more cheerios had I had more, That would have cut down on sweetness. But I did add more sugar when I added the chocolate and coconut so…..
I’ll give them another try, I’m sure every time will have different add in’s and kinds of cereal. I like someones idea for taking them camping….. Add a ton of other fruit and nuts to last the morning. Let’s see… I wonder if you used a salted nut and something tart like cranberries – maybe they’d be less sweet for you? 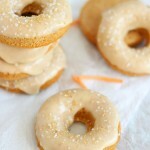 Coconut would definitely make this sweeter, and they are sweet to start. I’m glad you liked them otherwise! Thank you for the feedback!